He has won in 2013 the Newman Prize, awarded by the University of Oklahoma and an international jury to an author writing in Chinese (of any nationality). He is in good company with Mo Yan in 2009, Han Shaogong in 2013 and in 2015 Zhu Tianwen. Yang Mu’s family is Chinese, settled in the island for centuries. Born in 1940, he is the eldest of six children who live comfortably from the print shop that runs their father. 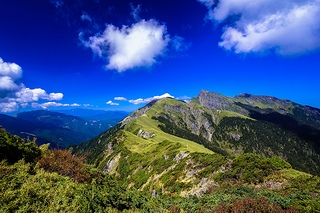 His childhood is only slightly disrupted by the war; the Japanese are hardly present in Hualien although their policy of colonization / assimilation, conducted for a long time, has been very efficient: at the end of the war, half of the Taiwanese people spoke Japanese. With small steps and through the eyes of a child, the author talks about this period. The family will flee the US bombing and took refuge in the interior near an Ami village. Amis are one of 16 aboriginal tribes, one of the most numerous(1/3), although the total Aborigines represent only 2% of the total population. It is an essential encounter for the author, it’s another world, completely different from the Han through its language, its customs, its economy … Respect from the author for the Amis will not prevent him to remain a stranger. Relations with the “continentals” are very tense after the massacres that followed the events of 2/28/1947 and during the “white terror” which lasted until 1987. The Taiwanese are despised: “Taiwanese, Japanese, it’s all the same. You’re all a bunch of conquered slaves without a country “(p.115). Encouraged by a teacher and a friend, he began at 15 years writing poems that he published in journals and newspaper literary supplements; in three years, 200 poems! Poetry in Taiwan is a much less sensitive issue than in Mao’s China where it was completely altered. Throughout this period, the question of language is central: Taiwanese and Japanese should not be spoken, this silenced a large part of a generation. Censorship is not interested in Western poetry translations but remains vigilant vis-à-vis China; one of his teachers advised him to read Shen Congwen, banned in Taiwan after having been censored in China! The Taiwanese heritage is for him essential, be it the history, the customs, nature, but he has not become like some others a “regionalist”. He is influenced by Chinese romantic poetry specially Xu Zhimo (1897-1931), and by the European symbolists and surrealists. His verses are grounded in reality and an abstract or theoretical approach is far from his character. “I have always felt that poetry should not come in response to a rush of emotions. Rather poetic inspiration should arise in a process of cool and objective consideration; it should ferment slowly with much attention to discipline and technique “(p.4) (2). 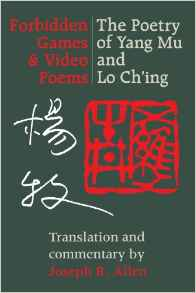 Yang Mu’s language is a fusion of a literary form derived from classical poetry and everyday language. The language is sophisticated; lyrical and autobiographical elements are present as well as many images from classical poetry. “Where does poetry come from? It comes from a passion. You press a surging passion deep down in the soul, fear it, test it, sometimes make it change colour. A passion of a different colour shifts position deep in your soul … It has no fixed form or character. It has realized that It was the motive form of art, It was the truth “(p.132) (1). “Poetry was the means of the interflow of information between the extended world and myself, the best and most effective way” (p.192) (1). Since 1956, Yang Mu has published fourteen books of poetry. Two books have been translated into English (“Forbidden games” and “No traces of the gardener“) and in French (“Someone asks me about truth and justice“). As for “Memories of Mount Qilai” if it is a collection of autobiographical notations but also cultural, historical, anthropological, it is also, for some chapters, a beautiful prose poem. Après university studies of foreign languages ​​and literature, in Taichung, the largest city in the center of the island, he left for military service to the island of Quemoy (five years after the bombings by the Chinese army). In 1964, he took part in the writing workshop led by Paul Engle at the University of Iowa and later enrolled in a PhD in comparative literature at Berkeley. 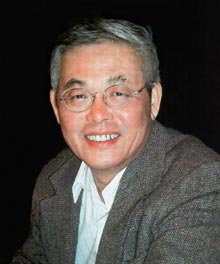 After graduating in 1970, he joined Washington University in Seattle; he was appointed professor in 1981, and also teached at the National Taiwan University in Taipei. This is an almost mythical figure in Taiwan (1699-1769) who arrived very young near the A-li mountain in the center of the island. Interpreter to the aborigines of the region, he tried to educate them and to have them abandon their practice of ritual murder; he will succeed but will sacrifice his life. This play is not very convincing and does not create a dramatization, but certainly shows no colonial approach. After 1987 and the cancelation of martial law, the aborigines protested against the presence of Wu Feng in history books where he was praised as”civilizing”influence of the Han Chinese! 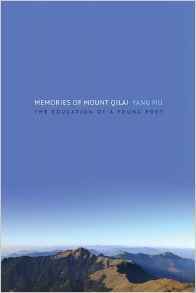 (1) Yang Mu, “Memories of Mount Qilai, the education of a young poet”, translated by John Balcom Balcom and Yingtsih. Columbia University Press, 2015, 273 pages. 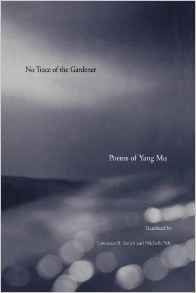 (3) Yang Mu, “No traces of the gardener”, translated by R. Smith and Michelle Yeh. Yale University Press, 1998 (poetry 1958-1991); 230 pages. 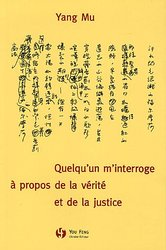 (4) Yang Mu, “Someone asks me about truth and justice”, translated into French by Angel Pino and Isabelle Rabut. You Feng Editions, 2004, 120 pages.